Giant bronze ants made with motorbike parts crawl menacingly on the floor, Cubist sculptures kiss and a Durga with a headlight for her third eye looks down on the viewer. The room that hosts artist Paresh Maity’s bronze sculptures at Mumbai’s Jehangir Art Gallery is also home to a 20-minute video, Kolkata to Kozhikode, that traces the path of the monsoon. In the other, larger space are Maity’s oil on canvases, mixed media and photography works. A sole watercolour stands testimony to what has long been the artist’s trademark—landscapes and seascapes. It depicts a fishing village in Orissa, one that Maity visits every year, and one that he brings alive here in ethereal blues. Most striking of all, however, are the black and white photographic portraits of children, young girls and fisherfolk. Maity has worked over the photographed images in pen and ink, rendering them with a dreamy exuberance. His canvases, with their straight geometric lines, evoke Picasso. Supervising installations a day before his show opens, Maity even points to a painting that is a less aggressive interpretation of Picasso’s famous Guernica, the painting that depicted the bombing of Basque country during the Spanish Civil War. Montage Moments Memories is Maity’s largest solo show till date. He has been prolific: The 44-year-old artist has had 52 shows so far. But this one comes after a four-year break. This is the first time the prestigious Jehangir Art Gallery has lent two spaces to a single artist. Viewed independently, some of the works on display are fabulous. The canvases are an interplay of warm hues and vibrant colours. Several large panels are tableaus that criss-cross the figurative, the representative and the stylized. The one that Maity refers to tentatively as Varanasi shows a number of characters from the holy city, each in a different act—praying, bathing, getting wedded, dying. But apart from the artist himself, there seems to be little that connects the four disparate parts of the show: The sculptures are called Face to Face, the suite of canvases is called Mystic City and the photographs, Faces of Life. The artist says, somewhat unconvincingly, that what connects them is water. “I grew up next to the water and I believe water is life," he explains. He alludes to milk, curd and cheese—different forms of the same stock; a transformation to another language. Then he offers another explanation: The people in the black and white portraits were working and living around his studio in Santiniketan in West Bengal. Born in Tamluk, situated on the banks of the Rupnarayan river in south Bengal, Maity did grow up seeing water. 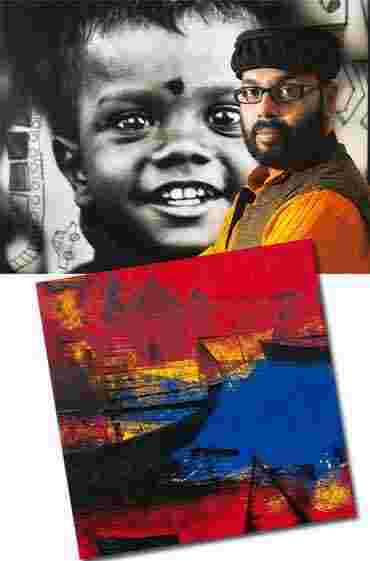 He graduated in fine arts from the Government College of Art and Craft in Kolkata and obtained his master of fine arts from the Delhi College of Art, topping his class. Known earlier for his watercolour landscapes, he moved gradually from atmospheric scenery to representations of the human form. He has won a number of awards, including one from the Royal Watercolour Society of London in 2002. For the last few years, photographer Nemai Ghosh—best known for his portraits of Satyajit Ray—has been documenting Maity at work around the world. The photographs will be released as part of a documentary-styled book early next year. Brushing some fibres off one of his canvases, Maity comments on the presentation at the show. “They’re all museum frames," he says, while emphasizing the multiplicity of artistic media in the two rooms. Evidently, that’s the crux of the show. Paresh Maity takes Marshall McLuhan’s aphorism very seriously: The medium is the message. Montage Moments Memories, which opened at Jehangir Art Gallery on 10 November, will show there until tomorrow and will then be on display at Art Musings Gallery, Colaba Cross Lane, Mumbai, until 9 December.